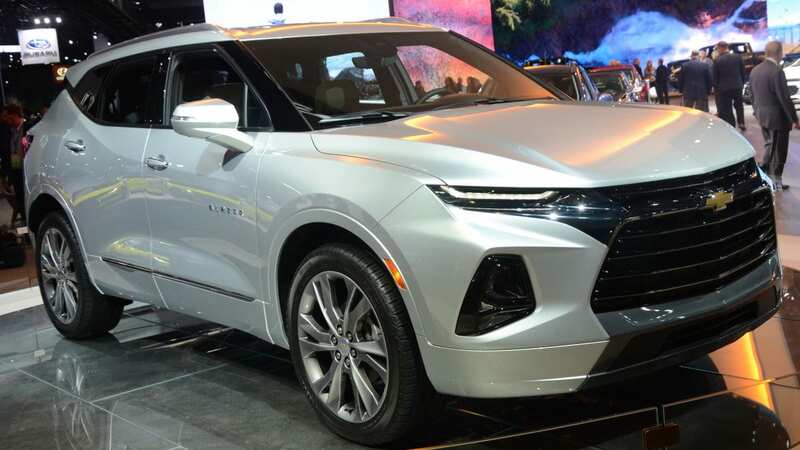 The all-new Chevrolet Blazer makes its formal Motor City debut at the ongoing 2019 North American International Auto Show in Detroit’s Cobo Hall and frankly, I think that it looks far better than many of the bland, unexciting SUVs sold in America today. The new Chevrolet Blazer was introduced by means of a social media rollout last summer and since then, a great many people have been critical of the exterior design. Many people insist that the designers tried to make it look like a big, four-door Camaro and there is no question that the similarities are there, but suggesting that the styling of the new Blazer is a bad thing is nothing shy of foolish – unless you prefer the run-of-the-mill, bland SUVs that have long-dominated the industry. The new Blazer was prominently featured during the opening “media days” of the 2019 Detroit Auto Show earlier this week and it will continue to be on display through the public days, giving show-goers a great chance to see the vehicle in person. While I have seen these new vehicles testing on the roads around my home in Milford, Michigan, this was the first time that I got to really check them out up close and I’m not shy to say that I like the look. More specifically, I like the exterior design. This is a “sports utility vehicle”, so I fail to see the flaw in implementing exterior styling from the company’s best-selling performance car and more importantly – the new Chevrolet Blazer introduces aggressive, edgy styling to a segment where many of the competitors all blend in together. The front end really does look like the Camaro, from the hood to the bottom of the grille, and I think that it makes for a great-looking SUV. From the side, the new Blazer has sleek lines that fit with the aggressive front end. Even though this isn’t a performance model, it has a sporty look that is lacking from many of the popular SUVs, particularly those in the mid-sized segment. It is long and low, with a “floating roof” look that is created with black trim on the pillars and while the rear end doesn’t offer as striking of a look as the front, the LED taillights complete the sporty look – albeit in minimal fashion. The complaints about the new Blazer looking like the Camaro are accurate in the accusation that there is a similar look, but those people are wrong in saying that it is a bad thing. One of the key complaints with many midsized SUVs and crossovers (whatever you prefer to call them) is that they have bland, boring styling. Chevrolet has been accused of bland-looking utility vehicles in the past, but with the new Blazer, the designers took a risk and went sporty – introducing the look of the Camaro to the new SUV and I think that it is a great move. While some people are criticizing the new Chevy Blazer because of the Camaro-like front end design, others are unhappy that it isn’t more like the K5 Blazer that was discontinued in the early 1990s. Those people are right, as this new unibody, midsized SUV is nothing like the K5, but neither was the S-10 Blazer or the TrailBlazer, so sentencing this new vehicle to failure based on the fact that it isn’t similar to the K5 is an angle that really doesn’t hold any value. Ultimately, if you want a big-bodied, body-on-frame vehicle like the old K5 Blazer, you don’t need to wait for a new Blazer, you need to go buy a Chevy Tahoe. The Tahoe is today what the Blazer was in the 60s through 90s, while the Blazer today is more like the versions that were sold from the 80s through the mid-2000s. In other words, this new SUV appears to be an evolutionary replacement for the last TrailBlazer and with the sporty Camaro styling, this new Chevy Blazer should appeal to buyers who want a sporty-looking, midsized SUV that stands out from the ultra-vanilla styling that has plagued the segment. Well I sure hope it sells better than the Camaro. Usually one tries to emulate successful selling cars if you are gonna copy their styling. It's an SUV, so it should sell pretty good. I love the new sporty look of the Blazer. I sell Chevrolet, Buick and GMC vehicles and I just sold our first RS Blazer to a young couple. They were very impressed with all the features including rear heated seats and the birds eye view and all camera angles included in the RS models. The front of the truck may look like a Camaro, but from the side it looks like a Traverse. No thanks. I am in the market for a new SUV but will never buy the Blazer because you can't turn off the very irritating Start/Stop engine option..GM has made a serious marketing error in not giving the owner the option of turning off this worthless option..